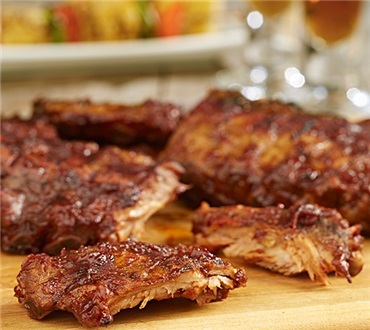 The luscious meat of our famous Baby Back Ribs practically flakes off the bone it's so meaty and tender. They're marinated in traditional spices and fully cooked. So convenient, they're ready in minutes and all you do is heat them on the barbecue, in your oven or in the microwave. Guaranteed to be the best you've ever tasted or your money back! Try some for yourself. One bite and we know you'll be hooked. Send some to your favorite rib lovers, too! 2 Racks of Ribs (one package) weigh 2 lbs. This package is perfect for two. Ribs have lots of flavor and are really baby ribs. If you are not sure if mayb too small go with bigger regular ribs. This was just right for us. Because we are watching calories we got to meals from pkg. not for big appetites so go for larger pkg. Reheat and your are ready to go! Our family made Dakin's Ribs this year for Thanksgiving instead of the ol'e bird. Loved them, just heat and serve , tender ,tasteful , very good bbq sauce that they prepare them with. Will buy again !